This exercise (.zengo-undo) involves a series of turns, reversing direction. 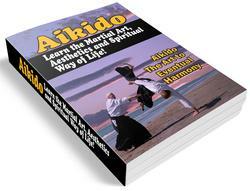 When applied to Aikido techniques, it models a response to attacks from two or more attackers coming fiom opposite directions. It also models demands from two different jobs or chores that threaten to divide time and attention. Turn completely, directing ki, mind, and attention, strongly forward while remaining balanced and centered. Pattern is "hips-hands-hands-hips." At count of "One," shift hips forward, then swing arms up, opening hands and extending fingers. At count of "Two," drop arms back down to sides, closing hands softly; shift hips back. On balls of feet, pivot 180 degrees. At count of "Three," repeat Step 1, shifting hips forward, then swing arms up, opening hands and extending fingers. 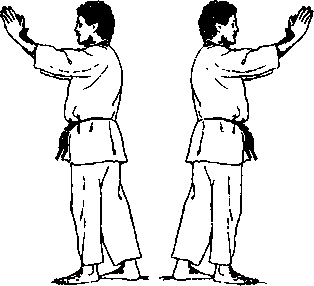 At count of "Four," repeat Step 2, swinging arms back down to sides, closing hands into soft fists; shift hips back. On balls of feet, pivot 180 degrees. Pushing straight back on chest. Pushing straight forward at upper or lower back. Attempting to lift nage from ankle. 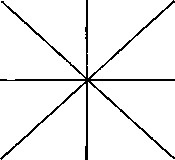 The Eight-Direction Exercise (happo-undo) is ikkyo-undo (page 131) or zengo-undo ('Two-Direction Exercise*" on page 134) with a series of turns in "eight" different directions. Like zengo-undo, it models multiple attacks, but from two or more directions. As in zengo-undo, the point is to turn completely, to direct ki, mind, and attention strongly forward while remaining balanced and centered. The temptation is to leave your mind behind, to split your attention, to be overcome by second thoughts, regrets, the accumulated weaknesses of small failures. Continuing through a series of turns, nage typically becomes more and more unstable, usually falling backwards in response to a test to the chest, having left mind behind. If you are an advanced student who has forgotten how confusing this is to beginners, do the exercise backwards (stepping back on the ikkyo motion rather than forward). 1. Step forward with LF. Swing arms up into ikkyo then down. Turn right 180 degrees stepping into right hanmi (RF forward). Swing arms up into ikkyo then down. Turn left 90 degrees stepping into left hanmi (LF forward). Swing arms up into ikkyo then down. Turn left 45 degrees stepping into left hanmi (LF forward). Swing arms up into ikkyo then down. Turn right 180 degrees stepping into right hanmi (RF forward). 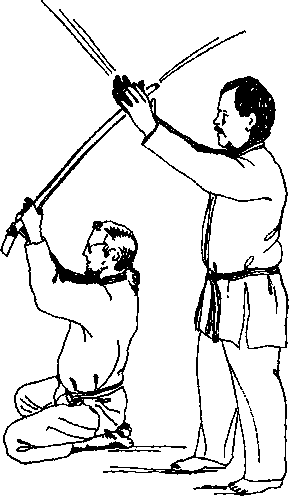 Swing arms up into ikkyo', hold position. Uke test. Start in odd directions to eliminate dependence on a particular wall or direction. Do it with eyes closed to eliminate visual clues. If you do this exercise based only on visual clues, you can become so dependent on them that you may be unable to do it in a different space, a different dojo.